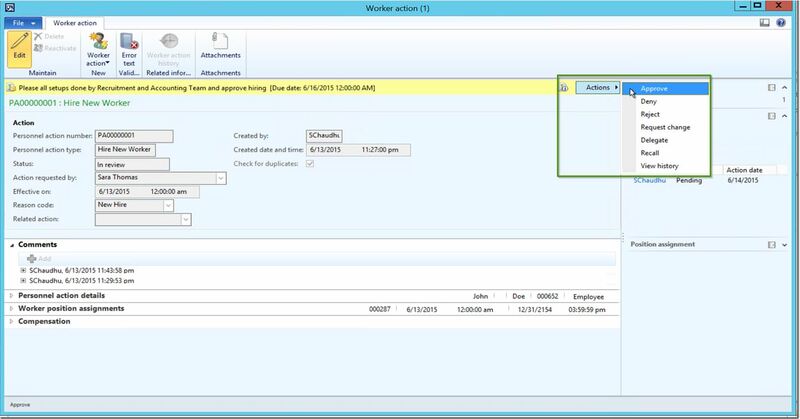 If you are the customer looking to implement or using Microsoft Dynamics AX 2012 R3 and use major aspects of Workforce management under the Human Resources Management, there are some Out-Of-The-Box workflows under the HRM module that you can leverage to complete/automate several key processes such as Hire a worker, Transfer a Worker, Terminate a worker etc. You could use these new workflows build the complete onboarding process for the new hires into the workflow. In this post, I will explain you about these workflows and how you can use them in AX 2012 R3. 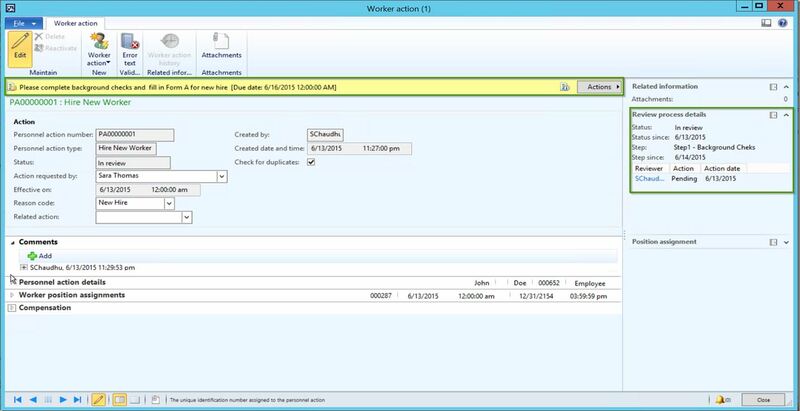 Note: You will need to activate the Personnel Actions Configuration Key for the HRM, to enable these new functionalities in the system. For this demonstration, Let us say there are 3 steps in human resources completing the onboarding process for a worker before their hiring process can be completed in AX and a worker record can be created. Step1 : Complete background checks and fill the Form A and attach filled in Form. Step2: Complete the online test for on-boarding for the new hire and attach test results. Step3: Final Approval and worker creation in AX. 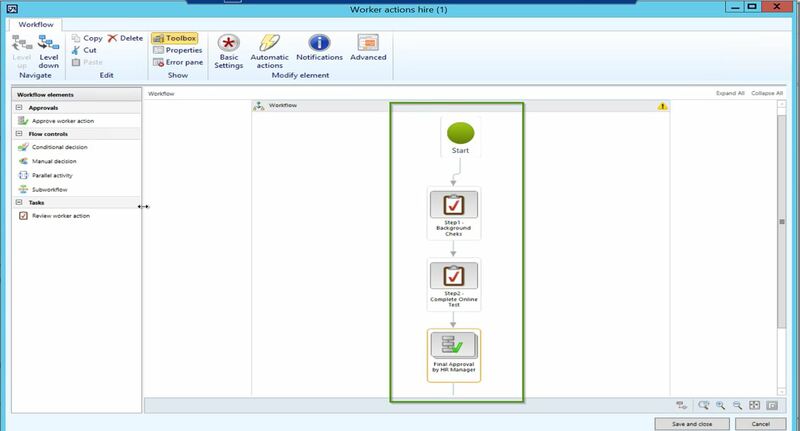 The screenshot below shows that the workflow setup which has 3 distinct steps for performing several tasks related to new hire’s onboarding before the worker record can be created in AX. The final step of the workflow is the approval of a worker record after all the prior tasks are completed by respective team members. The workflow is set up and is activates now in the system. The next step is to configure a Personnel Action type. 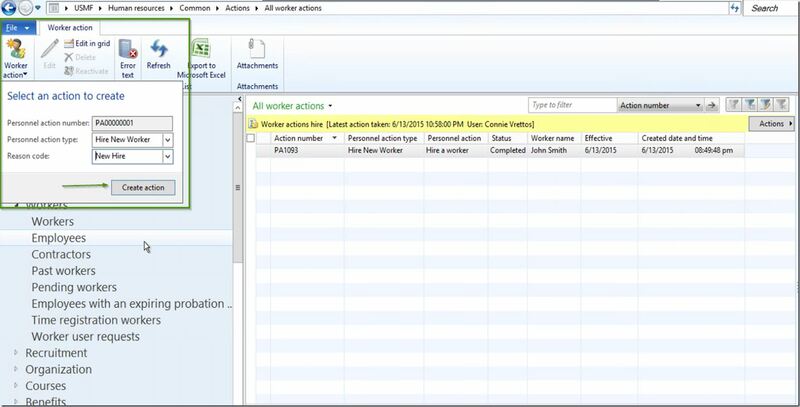 You can configure as many personnel actions as you want/need and associate each action type with a personnel action and then link it to the workflow it should follow. In our example, I have created a simple action called Hire New Worker and linked it to a workflow we created above. 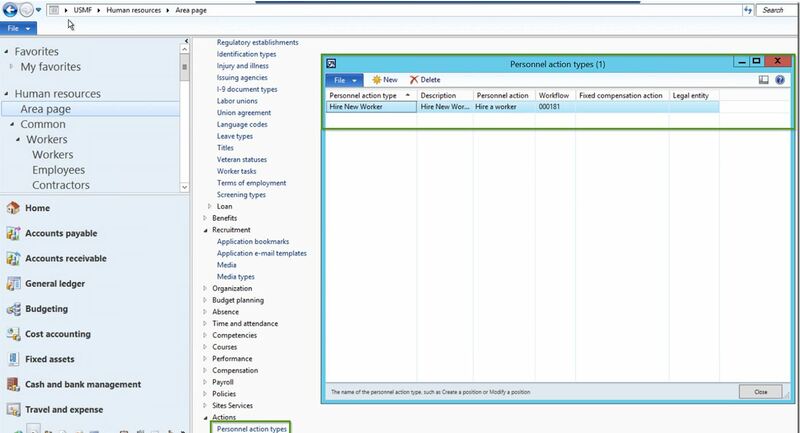 The screenshot below shows the Personnel Action Type. Let us start the hiring process from All Worker Actions list page. Navigate to HRM > Common > Actions > All the Worker Actions. 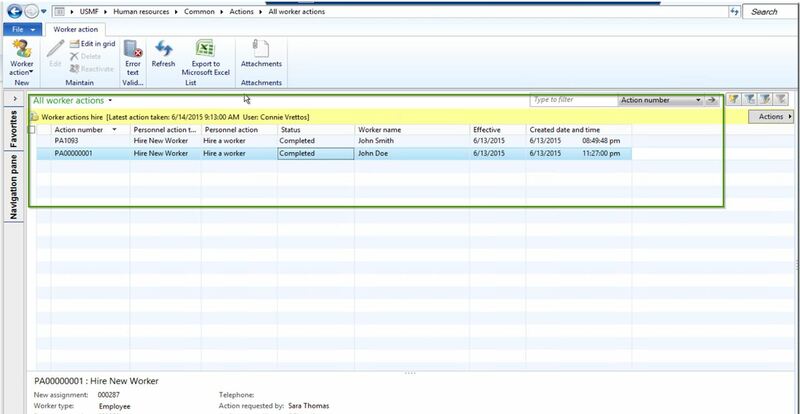 Click New Action button and choose Hire New Worker as the Personnel Action Type and click Create Action. 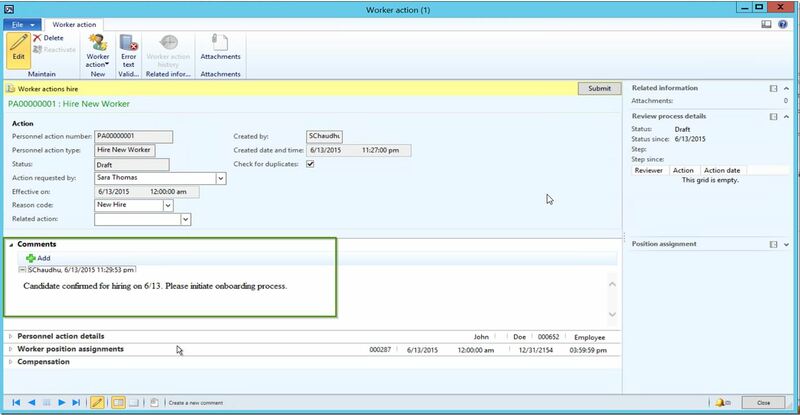 On the next screen, you will notice that all the required fields you will need to enter to submit the Hire New Worker action request to the workflow. Select various data fields such as Action Requested by, Worker’s name details, an entity in which he is employed, Worker type, employment start date, Position assignment details etc. under the corresponding fast tabs. You can also enter the additional comments for the reviewers in the workflow about the new hire under the Comments fast tab. 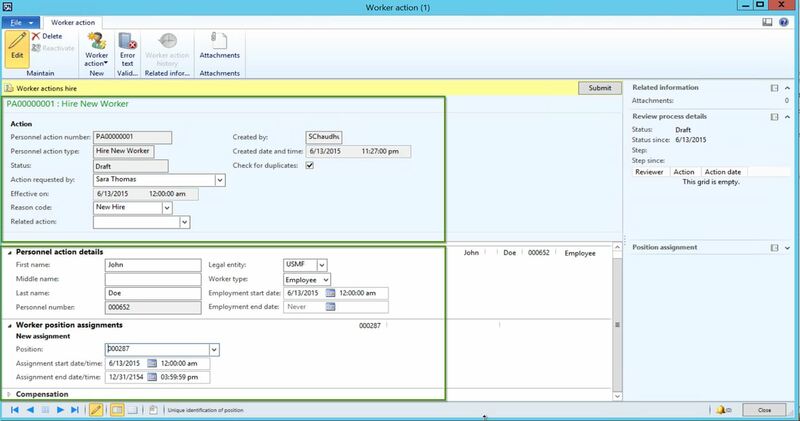 NOTE: You can customize this form to automate the setup of several other information attributes for the workers such as financial dimensions, addresses, contact information and any other key data fields on the worker record, so that those can be embedded into the workflow of onboarding and upon completion, the values will be set up already on the worker record. When you are already ready to submit it, click the Submit button. This will get the worker action into the Hiring Workflow and will be routed to the required teams for processing. The standard dynamics AX workflow engine can also be used to send an email notification within required instructions for completing the steps of on-boarding. When it is submitted, it will get assigned to a person responsible for Step 1 of on-boarding. They can then review the checklist for Step 1 and take required actions and mark the Step 1 as complete. If they wish to request a change of data information from the submitter, then can choose that option as well in the workflow. The screenshot below shows the workflow is now assigned to the person responsible for Step 1. They can review the checklist for step 1 under the workflow step instruction section. Once the person completes the Step1, they will click Actions > Complete. As soon as Step1 is marked as Completed, the workflow is now assigned to the person responsible for Step 2. The Review process details fact box on the right shows the current step process is in. The person responsible for Step 2 will then complete the online test and then will attach test results to the action record and mark the step as Complete. At this point, workflow gets assigned to the final reviewer of information, who is the HR Manager. He can review all the details on a worker hire action and Approve the New hire action. Upon successful approval, Worker record will be created automatically in the Worker master under HRM > All Workers. Once the Action is completed, you can view an overview of all the worker actions on All workers list page. Now navigate to the All Workers form under the HRM and Verify that the Worker record for John Doe will be created with all the details that were entered on the hire action. Workflow For Actions on Transferring a Worker & Terminating a Worker: Just like we created a workflow for the Worker Hire action, you can also leverage the transfer and termination workflows and configure all your required steps and continue to use Transfer and Terminate worker actions.